Furnace maintenance is something every homeowner should invest in before it gets cold. 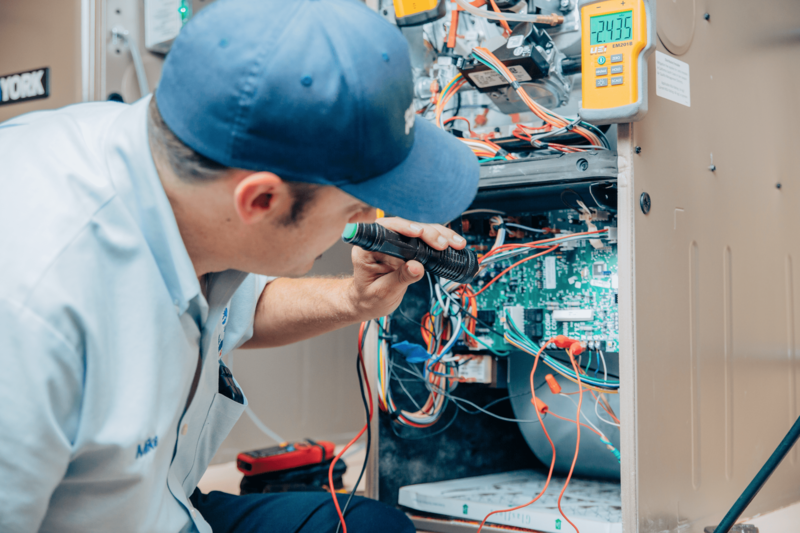 Not only does regular maintenance help homeowners avoid costly furnace replacements or repairs, but it also keeps the manufacturer’s warranty intact and can extend the life of the furnace. There are many ways in which homeowners can maintain the efficiency and lifespan of their home furnace, and together with scheduled preseason furnace maintenance form a licensed professional, homeowners will be sure to have their furnace prepared for winter in order to stay warm on those cold and damp winter nights. The filter in every HVAC system is one of the most important aspects to an efficiently running system. Most HVAC professionals recommend changing the filter quarterly, minimum. However, there are many times when changing the filter each month is ideal. Homeowners with pets should invest in a highly efficient filter and check it monthly. Likely, they will find the filter has done its job by blocking pet hair, dander, and dirt, but this will build upon the filter and clog the system. The system then has to work harder to maintain proper airflow. This puts a strain on the system and can lead to problems with the HVAC system and costly repairs. Homeowners that live in dusty and dry areas should also check and clean, or change, their filter more often. Many filters are reusable, so it is easy to remove the filter, clean it and replace it. And with higher MERV rated filters, homeowners can also be sure they are breathing clean and fresh air. Homeowners can schedule this to corresponds with paying the bills, or another monthly household task for easy remembrance. If homeowners are still using manual thermostats, it may be time to upgrade. With so much smart technology, there is no reason to ever have to set the thermostat and manually adjust to reach the ideal temperature throughout the day and night. By investing in a smart programmable thermostat, homeowners can achieve the perfect temperature form anywhere that has Wi-Fi. Programming the thermostat to run at certain temperatures at certain times can also save on energy and help maintain efficiency. Many homeowners wonder if they should leave the furnace running throughout the day or turn it on and off as needed. With a programmable or smart thermostat, the question is answered. By maintaining a perfect temperature, the system actually runs better and is more efficient. During the day, the recommended temperature is between 62-66 degrees. Homers can set that temperature to 72 or 74 degrees in anticipation of their return from work, school, or errands and walk into a warm home. At night, did you know it is actually better to sleep in a cooler climate? Try programming the thermostat to drop to between 62 and 66 degrees an hour after you go to bed for ideal sleeping and an energy efficient temperature. It can be programmed to go back to 72, or 74, as you rise, and homeowners will never have to run to the thermostat and wait for warmth before starting their day. And if homeowners change their plans and are suddenly away from their home? Its no problem, invest in a thermostat that can be controlled from a smartphone or tablet and turn the system off to ensure it is not running when no one is home. Homeowners can also ensure that the furnace is not blocked by boxes, furniture, or flammable items. Many times, the furnace is located in a garage or attic, which can also turn into a place to store household items. Blocking the furnace can reduce its efficiency and can also be a safety hazard. If the furnace runs on natural gas, as opposed to an electric furnace, HVAC professionals recommend cleaning out any combustible or flammable items from the area. All natural gas appliances produce off the gas and can be dangerous if they develop leaks. Every homeowner should have a licensed HVAC expert perform an annual tune-up and safety inspection of their furnace. Bill Howe Heating & Air recommends performing this during the fall months, prior to the onset of cold weather. Preseason times are typically easier for availability, and it provides the homeowner comfort in knowing when they truly need it, it will work at its optimal level. And, should the furnace need repair, there is plenty of time to schedule and ensure a properly working furnace. At Bill Howe Heating & Air, homeowners can expect a full tune-up and safety check form their furnace expert. The maintenance will extend the life of the system and ensure homeowners and their family, and property, remain safe all winter long. Check for problems such as natural gas and carbon monoxide levels, and leaks. If homeowners do not have carbon monoxide detectors, an HVAC professional will recommend them. In fact, it is California law that all households with an attached garage and/or a fossil fuel source appliance, such as a stove or furnace, to have functioning carbon monoxide alarms. They are even designated to be placed in specific areas. Visually inspect heat exchanger for cracks or poor functioning signals. Vacuum and clean the burners and heat exchanger. Debris and dirt can build up within the system causing it to work harder and less efficiently. Check fan and blower motors, and thoroughly inspect the wiring for poor connections or possible interference. Check safety controls to ensure all are properly working. Visually inspect flue piping and venting. Because natural gas appliances produce off gas and carbon monoxide, venting is important to the safety of the system and homeowners. Adjust burners, pilot, and thermostat as needed. Burner flames should be a bright crisp blue. Homeowners can also visually inspect the flames on a regular basis. Do not remove the cover, simply view the flame through the front panel. A yellow or dull flame should be checked by a professional technician as they can be signs of poor gas flow or a leak. During regular maintenance, the technician is inspecting all safety aspects as well as cleaning the system and oiling mechanical components, just like a vehicle. Poorly maintained furnaces may require additional work or require a full diagnostic if they are not working properly. 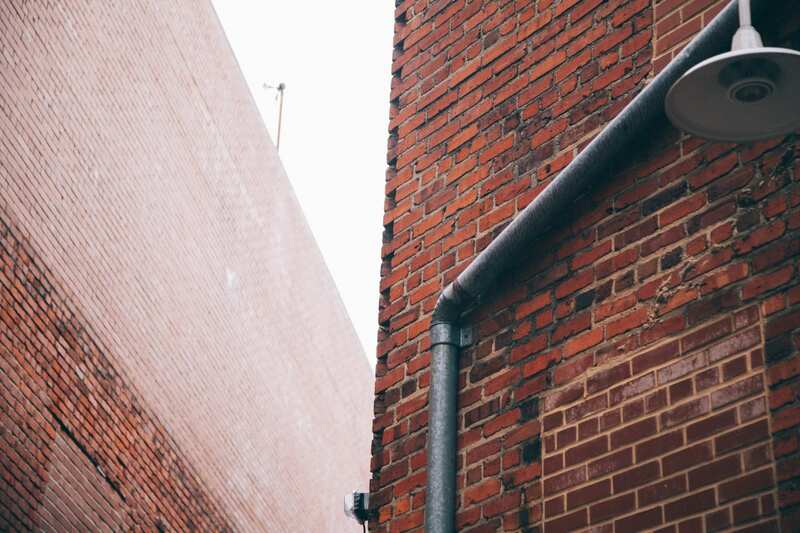 Some homeowners may find that their furnace simply cannot be maintained due to age. There are times when an older system may get one more year of life, but homeowners should consider replacing systems past their prime. Not only do they pose a higher safety risk, but they will also run less efficiently no matter how often a filter is changed. 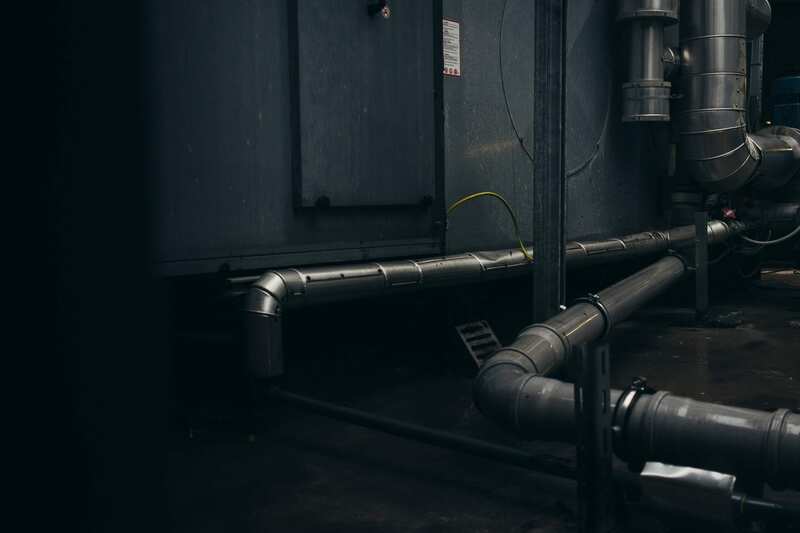 During maintenance, professional HVAC technicians can assess the systems overall health and age and make recommendations for immediate or future repairs or replacement. If the furnace simply won’t turn on, is 20 plus years old, it is time to invest in a high efficiency furnace. 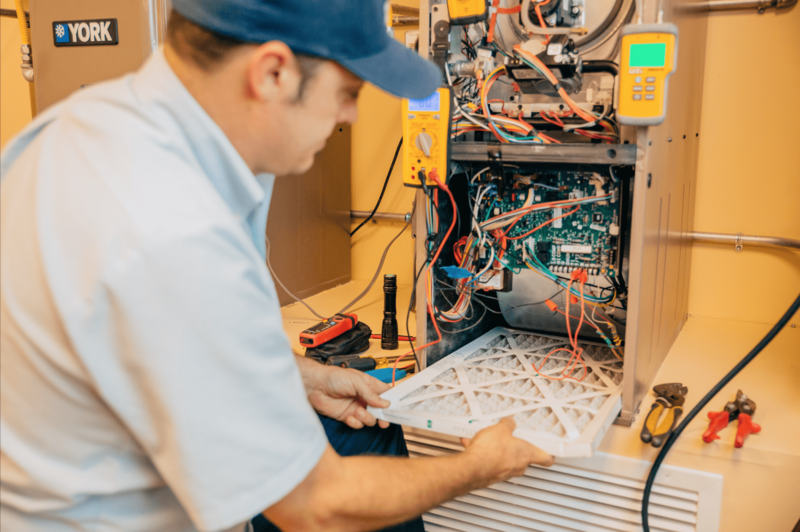 The great news for homeowners who schedule their maintenance in the preseason, most HVAC professionals offer incentives to change out their old furnace early. Whether homeowners need regular maintenance or need a full diagnostic or replacement estimate, call the professionals at Bill Howe Heating & Air 1-800-BILL HOWE (245-5469). With over 40 years of experience and a company that San Diego has trusted since 1980, homeowners are in great hands with Bill Howe furnace experts.